Seungmo Parks first solo exhibition in Berlin at MagicBeans Gallery shows a complete universe of his works, layers and concepts. The title “Be Beware of the Seductive Traps of Spiritual and Psychic Power Seungmo Park” can be taken literally. We met the Korean artist yesterday during the last finishing touches and dived into his genuinely seductive works. Join us for an exclusive preview of the opening tonight! Seungmo Park, born in 1969 in Sang Chung, South Korea, studied sculpture at Dong-A University in Seoul. Today he lives and works after a 6-year stay in India, preferably in New York and Berlin. In Germany, his works are currently also on display at Ngorongoro or the Galerieverein Leonberg. In his MAYA series he is using metal lattices, so the sculptor in the room creates an illusion of real events, comparable to the transmission of an image by a projector. 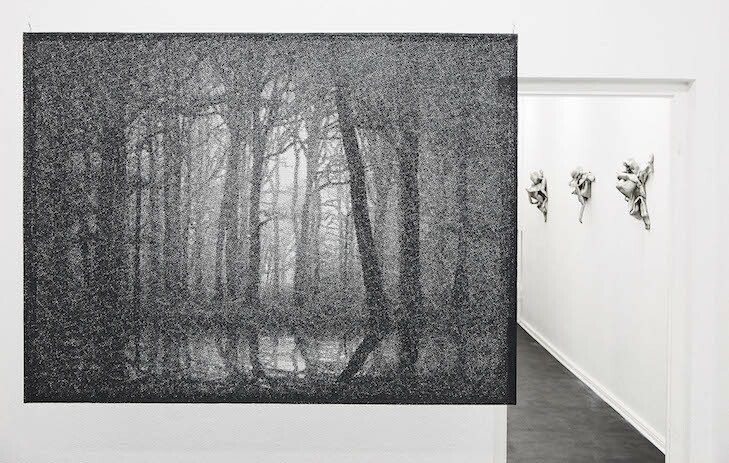 Seungmo Park is interested in the relationship between reality and the perceptibility of things. He raises the question of the actual provability of the existence of beings and things, being and non-being. These complex structures are reminiscent of landscapes or people, but always emphasise the absence of things. 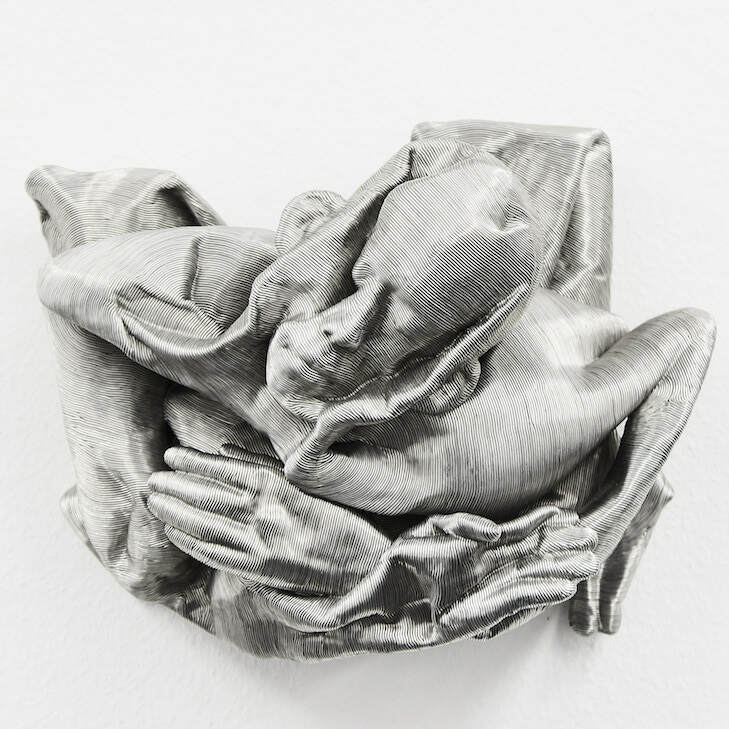 But in his solo show at MagicBeans, it is primarily the combination and the positioning of old and new works in the gallery rooms on different levels, which creates a nearly 3D like the lively feel and the knock-on-effect of this show. Without going into to much detail as this is an exhibition one should experience „in situ“ we give you a summary of some works and the effect they had on us! 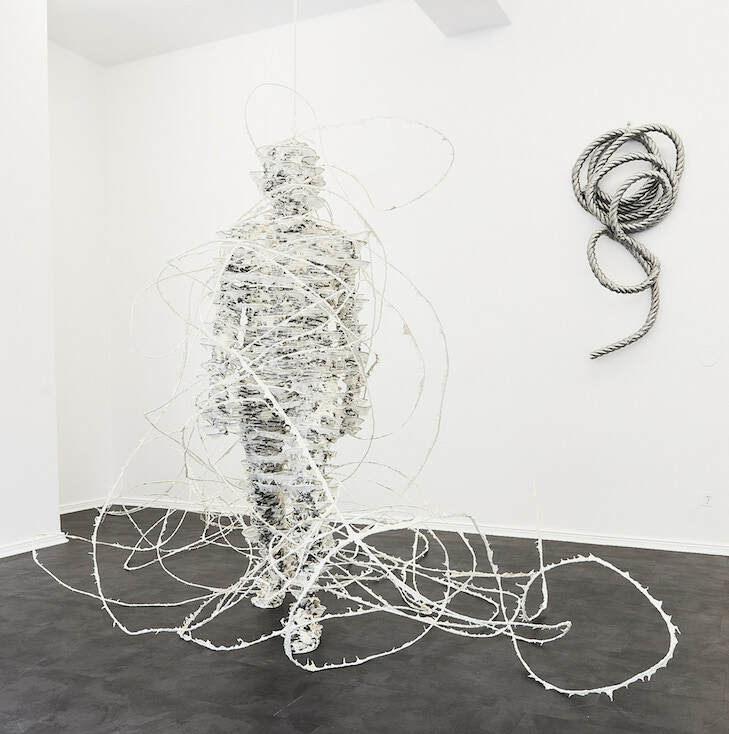 While the first room is dominated by a Hellraiser like new large wire and pulp sculpture that seems to be rotating in itself, simultaneously expanding into the space surrounding it, the very last work which can be seen has an entirely different energy and feel. It is placed at the end of the hallway of the gallery and is, therefore, setting a final visual focal point for the viewer. 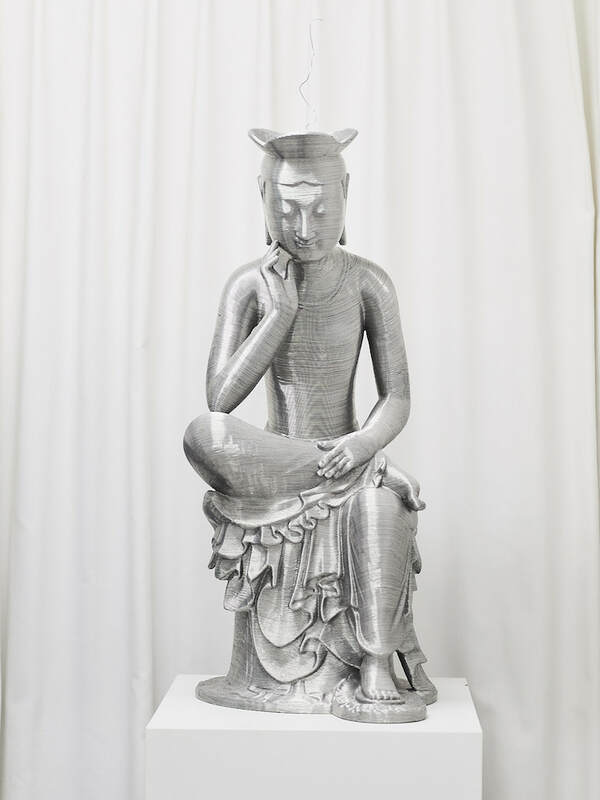 The Buddha statue made out of aluminium steel wire has its material beginning peeking out of the head of the figure, a single wire. It is this work that captures completely the concept of the Mandala. A Sand Mandala used in the Tibetan Buddhist tradition involves the creation and destruction of the Mandala which is made from coloured sand. Once finished it is ritualistically dismantled again and symbolises the Buddhist belief in the transitory nature of material life. It comes to no surprise that many of Seungmo Parks work revolves around the ego and how difficult it is, to let go of it. A nearly impossible task it seems if we look at our today’s society, but also regarding the often larger-than-life egos of artists. 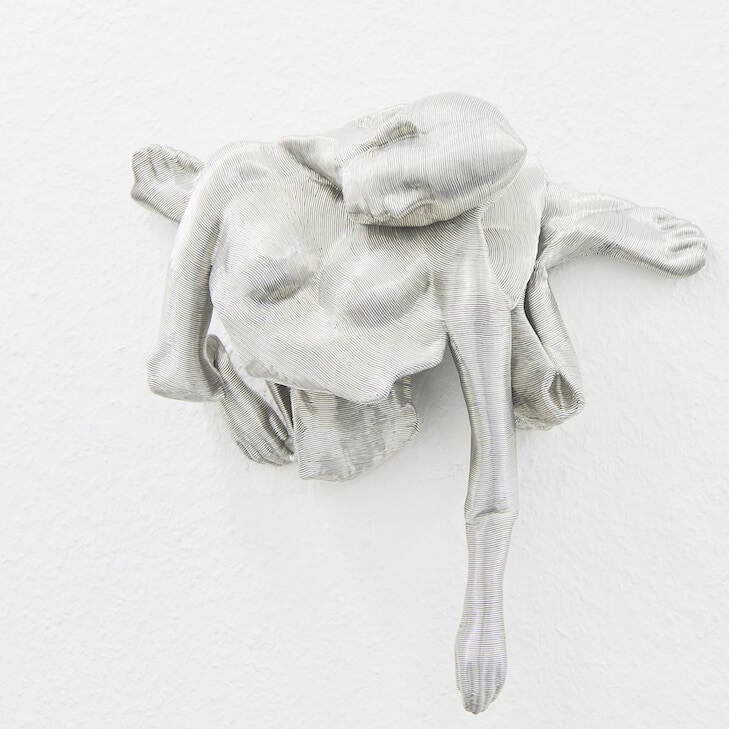 The works of his Human series, which are made from shaped aluminium look like someone sculpted a boneless body to a new and abstract version of a human shape, which reminds of our mortality and the Buddhist concept of emptiness. The wire evolving out of the buddhas head shows the beginning but also the ultimate end of the statue, as Seungmo Park is also known for destroying his works and their original form into its individual parts. Leaving behind a chaotic accumulation of wire, of pure material which confronts the viewer with a powerful metaphor for life itself.